Two game-day essentials combine into the ultimate party snack. 1. Put the flour in a large bowl. Put the crushed chips in another large bowl and whisk the eggs in a third bowl. Toss the drumsticks in the flour. One at a time, dip each drumstick in the beaten egg and dredge in the crushed chips, turning to coat. Place on a baking sheet until ready to fry. 3. 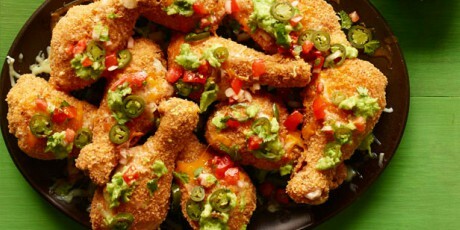 Arrange the drumsticks on a large ovenproof platter and sprinkle with the cheese. Bake until the cheese melts, about 4 minutes. Top with salsa, guacamole and pickled jalapenos.